two sons and a daughter. in a pharmacy in Berkeley which he later purchased and renamed Rumford’s Pharmacy. largely because of his ties to liberal Democratic Governor Edmund G. “Pat” Brown. race-based housing discrimination until the passage of the Federal Civil Rights Act of 1968. Medical Clinic are among landmarks named in his honor. Lawrence P. Crouchett, William Byron Rumford, The Life and Public Services of a California Legislator (El Cerrito, CA: Downey Place Pub. 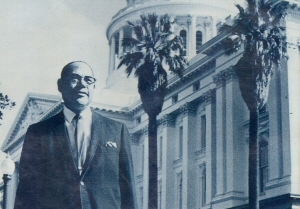 House, 1984); “Legislator for Fair Employment, Fair Housing, and Public Health: William Byron Rumford” (Earl Warren Oral History Project), http://www.oac.cdlib.org/view?docId=hb8n39p2g3&query=&brand=oac4. Health: William Byron Rumford” (Earl Warren Oral History Project), http://www.oac.cdlib.org/view?docId=hb8n39p2g3&query=&brand=oac4.